Galba was a scion of one of the few remaining patrician families in Rome. He came to manhood during the reign of Tiberius and served as governor or general during the reign of each of the Caesars. In 41 A.D., as he was serving as a governor of Germany, the emperor Caligula was murdered, but Galba refused the invitations of his friends to declare himself emperor. Claudius was grateful for his support and appointed him governor in Africa, and he served, as always, with a reputation for integrity and fairness. After a brief retirement, Nero appointed him governor of Hispania Tarraconensis, where he served until 68 A.D. when insurrections against Nero began. Galba was not inclined to take the leadership until he found out that Nero intended to put him to death, and that the praefect of the Praetorian Guard had declared in his favor. After the murder of Nero however, he assumed the title of Caesar and marched towards Rome. Unfortunately he was at an advanced age, and due to some poor judgment, failed to win the support of Praetorian Guards. Knowing that his reign would be short, he selected a man of the highest character, Piso Licinianus, as his successor. 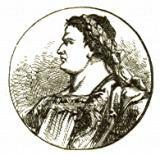 Otho, a nobleman of lesser character, who had hoped to succeed Galba then organized a conspiracy against him. Galba, who was already entirely enfeebled by age, was killed in a subsequent battle. Governor of Aquitania in Gaul under Tiberius. Governor of province in Germany under Caligula. 41 Refused invitation to declare himself emperor after murder of Caligula. Governor of province in Africa under Claudius. 60 Became governor of Hispania Tarraconensis under Nero. 68 After an insurrection against Nero was initiated, Galba was proclaimed emperor. 69 Murdered by conspirators after favoring Piso as successor rather than Otho. Nero Fifth emperor. Murdered mother, wife, and brother. Fiddled while Rome burned. Otho Emperor for three months in 69 A.D. Committed suicide rather than continue civil war. Caligula Third emperor. Sadistic and probably insane. Piso Licinianus Nobleman of good character, selected by Galba to succeed him.